All behavior serves a purpose (function). All behavior is maintained by one of the four functions of behavior. 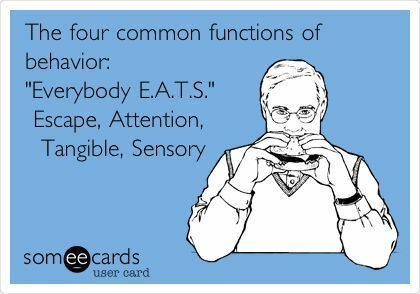 The four functions of behavior are: escape/avoidance from aversive tasks/situations/ people, attention, access to tangibles, and automatic (sensory). Behavior can maintained by multiple functions which is referred to as dually maintained behaviors. 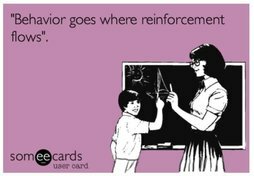 Before a behavior is targeted for change, it is important to determine the function of the behavior. If a behavior is changed or reduced without providing a functionally equivalent alternative, new behavior often maladaptive behavior can develop. To determine the function of a behavior a functional analysis (FA) or a functional behavior assessment (FBA) can be conducted. An FA utilizes experimental manipulations to determine the function of the behavior. An FBA utilizes a variety of assessment tools including direct observation, checklists, and questionnaires to hypothesize the function of a target behavior. ABC recording is often utilized to determine the function of the behavior. ABC recording is a direct assessment method that can be utilized to help determine the function of the behavior. When taking ABC data three categories are recorded. A (antecedents) everything that occurs before the behavior of interest is jotted down. B (behavior) the behavior of interest is recorded. C (consequence) what happens immediately after the behavior is recorded. ABC data can be recorded on a variety of forms including checklists to make recording of data easier. 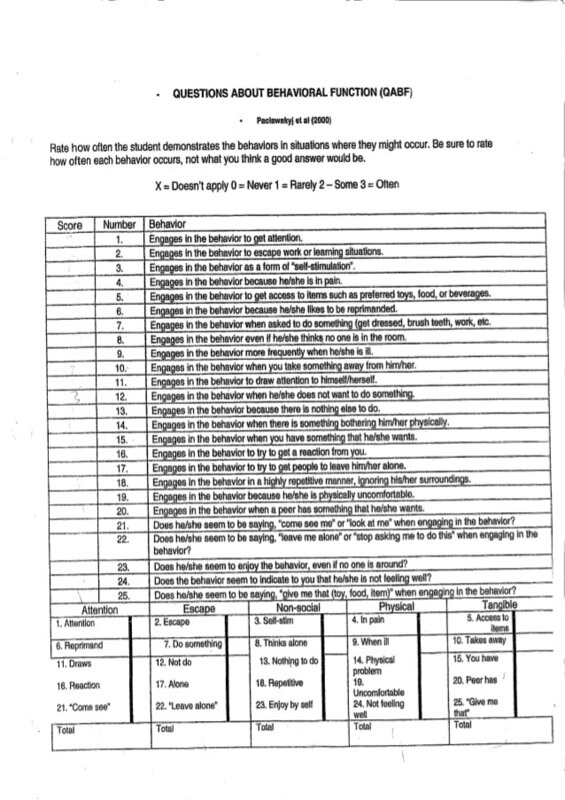 ​The Functional Analysis Screening Tool (FAST) is designed to identify a number of factors that may influence the occurrence of problem behaviors. It should be used only as an initial screening toll and as part of a comprehensive functional assessment or analysis of problem behavior. The FAST should be administered to several individuals who interact with the person frequently. Results should then be used as the basis for conducting direct observations in several different contexts to verify likely behavioral functions, clarify ambiguous functions, and identify other relevant factors that may not have been included in this instrument.